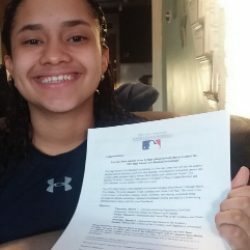 Aneyshka Aponte, a female baseball and softball player for the Berkshire Baseball & Softball Club, which is a subsidiary of the BIG Vision Foundation has been selected by Major League Baseball to participate in the 2019 MLB and USA Baseball High School Girls Baseball Invitational. The event will be held at Globe Life Park and the Texas Rangers Youth Academy in Dallas, Texas. 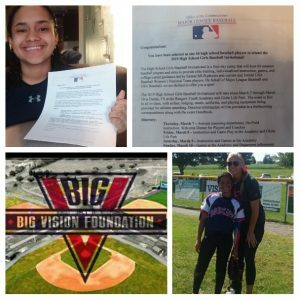 • In the midst of declining youth sports participation nationwide, BIG Vision Foundation increased the number of participants that played under the Berkshire umbrella by over 300%. • 72% of the players in the program come from the inner-city of Reading, Pennsylvania. • BIG Vision Foundation broke the mold of the youth travel sports industry by eliminating high cost player registration fees. • BIG Vision Foundation taught its players the importance of giving back to the community by having them volunteer, an endeavor that had resulted in over 2,000 volunteer hours generated by Berkshire Baseball & Softball Club players during the 2018 season. • BIG Vision Foundation Significantly increased the diversity of its programs.